A lighter version of a yummy soup! 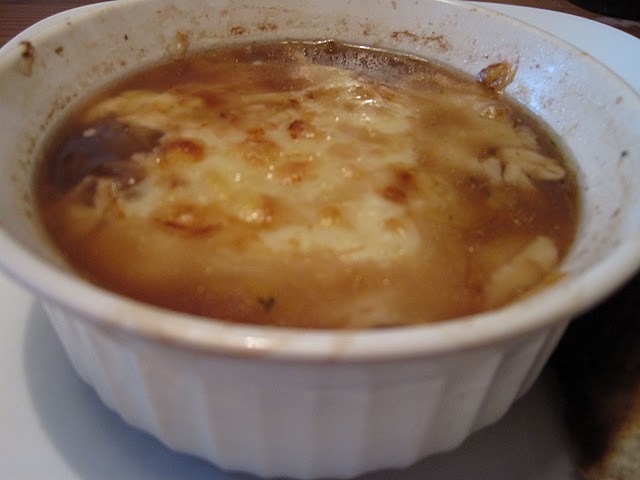 With a swap of some simple ingredients, like soy sauce and fat-free swiss cheese, you lose a lot of calories and fat! This has about 260 calories and makes 3 servings. In a large deep skillet heat oil. Stir in onions, thyme and some salt. Cook 15 to 17 minutes or until onions are very tender, stir occasionally, do this low and slow, so you don’t burn onions. Add wine and simmer 2 to 4 minutes or until reduced by half. Add broth, water and soy sauce. Heat to boiling, then reduce to simmer for 20 minutes. Add some salt and pepper to the simmering pot. Heat broiler on high, place bread slices on jelly roll sheet along with ramekins filled with the soup, place gruyere cheese on each ramekins and then a slice of swiss cheese. Broil 1 to 2 minutes or until golden brown. We are trying to eat healthy, once again here in our household. I wanted to lighten up this dish a bit, so instead of using a pasta I used a couscous. We love pasta in our house, but pasta isn’t too friendly if you eat a lot of it! This dish has about 415 calories and makes 2 servings. Place the flour on a large plate. Coat the chicken in the flour. Heat a large skillet over medium high heat. Add 1/2 tablespoon of olive oil and saute the chicken, 1 to 2 minutes per side until lightly browned. Remove to a plate and keep warm. Add reaming olive oil to skillet and stir in mushrooms. Cook for 2 to 3 minutes, until tender. Add in Marsala wine and cook for 1 minute, scrapping any pieces off the skillet. Add broth, salt and pepper. Bring to a simmer and return chicken to skillet. Simmer for 15 minutes. 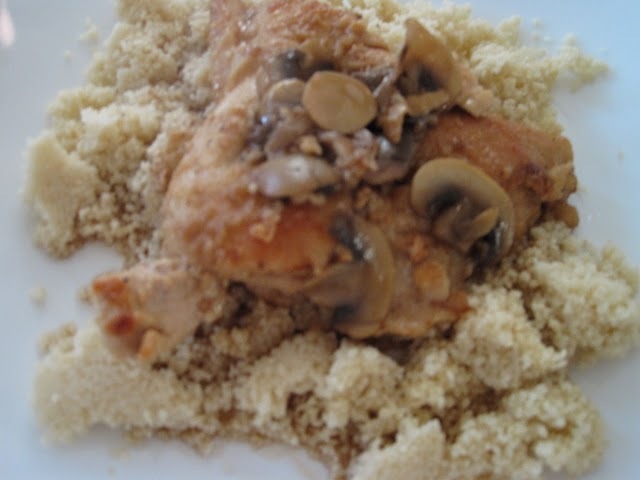 While preparing the chicken, start the couscous as to package. If using fresh couscous, I generally use 1 cup of water, boil it, add 1 cup of couscous, and turn off heat, stir and then fluff after 5 minutes. As a part of the Foodbuzz Tastemaker Program, I was invited to try Alexia products, so I opted to take advantage of it! , so I definitely wanted to try other products from them! I decided to try the Sea Salt Oven Fries. They were delicious! We didn’t need to add anymore salt to them. Not to mention all the ingredients are all natural and one serving size has 90 calories!! What fries do you know that taste good have that LITTLE amount of calories! These fries went great with our burgers we decided to make on the grill! Definitely pick up an Alexia product when you are out shipping next you wont be upset!